The Saturn is a puzzle manufactured by Mag-Nif, and it does indeed look like the planet Saturn. It is a ball with a flat ring around it which consists of eight numbered pieces. The ball is split in half so that you can turn one half through 180 degrees so as to turn over three adjacent ring segments. The ring as a whole can rotate about the ball so that you can choose which segments are affected by twisting half the ball. The pieces in the ring are numbered 1 to 8, and are the same on both sides. The Saturn outwardly looks very similar to the Brainball. 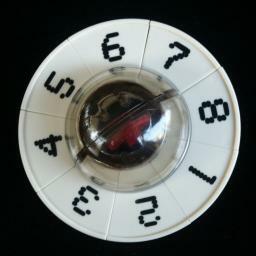 It is like a simplified Hockey Puck, though solving the puzzle is actually very similar to TopSpin and identical to rearranging the segments on a Masterball. The 8 pieces can be arranged in 8! = 40320 ways, but if we consider positions which differ only by a rotation of the ring as identical, then there are only 7! = 5040 positions. All these positions are attainable, but there are actually two solved positions - pieces in order 1 to 8, or in order 8 to 1. The puzzle is little more subtle than the previous paragraph shows. By twisting one half and then the other, the puzzle is in fact turned over. This means that you can solve the puzzle by only twisting the half that does not contain piece 1. As each twist is an even permutation, only even permutations are attainable so then there are only 7!/2 = 2520 positions whereas the other half can be reached only by turning over the whole puzzle. This means that if you never twist the half containing piece 1, then only one solution can be reached. Looking at the puzzle this way means it has 2520 positions with 1 solution instead of 5040 positions with 2 solutions. The table below shows how many twists those 2520 positions take to solve. The puzzle can be solved in no more than 9 twists (6.5810 on average). In Sloane's On-Line Encyclopedia of Integer Sequences this is included as sequence A079818. Mag-Nif. The homepage of the manufacturer. Pieces 1-4: The first pieces are rather easy. Consider piece 1 to be correctly positioned. All the other pieces will be arranged around it to reach the solved position. Do any moves (not involving piece 1) to place piece 2 diagonally opposite piece 1. A single move will now place piece 2 correctly next to piece 1. Do any moves (not involving pieces 1-2) to place piece 3 diagonally opposite piece 2. A single move will now place piece 3 correctly next to piece 2. Do any moves (not involving pieces 1-3) to place piece 4 diagonally opposite piece 3. A single move will now place piece 4 correctly next to piece 3. Below I will use a bit of notation. I will assume that you will hold the central ball in place and shift the ring around it. Only one half of the ball will then be twisted and the other half is held in place. The letters C and A will denote a clockwise and an anti-clockwise turn of the ring, shifting everything along by one piece. A twist of one half of the ball is denoted by a slash /. If twisting the half containing pieces 5-8 puts more of them in place, especially piece 5 or 8, then do so. By repeatedly swapping adjacent pieces with the move sequence above, the final pieces can be put in place. It is always possible to solve it using at most 3 swaps.